Hi, I am Tasha! I am an almost 5 year old girl looking for just the right home. I am a big girl at 60lbs and love to be active and be outdoors. I am near the Ottawa area and would like a home somewhere that isn’t too far to travel. Like many Airedales, I graduated top of my class in obedience but I have selective hearing outdoors. A fenced yard and NO cats is a must please. I am happy go lucky and like pats but I won’t pester you for constant attention. Right now I live with a little kid and I would be happier in a home with much older kids or very active adults. When I was younger I was attacked by some dogs and that has left me a little edgy around other dogs when I am on leash. but if you have the time for me, I am willing to learn. 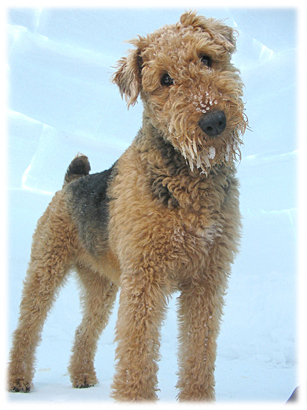 We just lost our Airedale to an illness, he was nine years old with the true Airedale personality. No other dog has a chance to replace him but, given a little time, another Airedale would be loved just as much. We have a single family home on one acre of land just outside Metcalfe, Ont (part of Ottawa) and would like to meet Tasha.